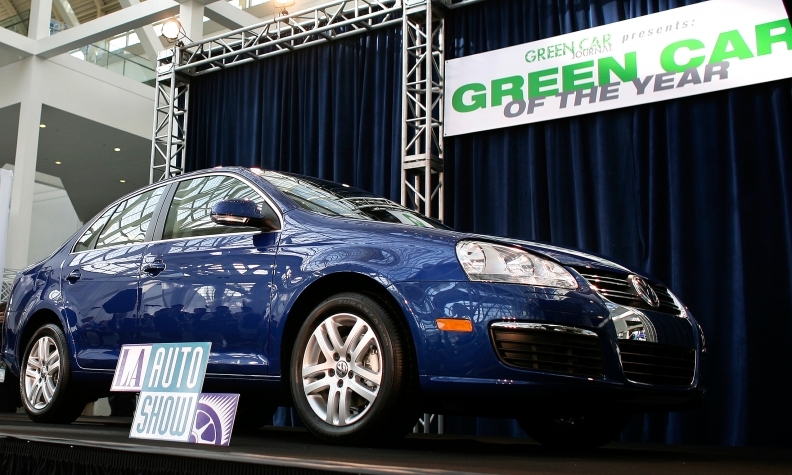 A 2009 VW Jetta TDI on display after being named Green Car of the Year by Green Car Journal in 2008. U.S. and California regulators are investigating whether Volkswagen AG deliberately circumvented clean air rules on diesel cars. WASHINGTON -- Volkswagen and Audi sold about 482,000 diesel vehicles with illegal emissions control software designed to make their cars appear cleaner in testing than they are in the real world, the EPA charged Friday. The claims are also outlined in a letter and notice sent by EPA officials to VW executives Friday. No fines have been ordered for now, as the investigation is continuing, but the EPA decided to announce the alleged violations to inform the public and “to put VW on notice of our continuing investigation,” Giles said. The investigation is being conducted in cooperation with California regulators. Under federal law, the EPA can levy a maximum possible fine of $37,500 per vehicle, EPA officials said on a conference call with reporters Friday, meaning VW and Audi face potential fines of up to $18 billion for the alleged violations. VW disclosed it has also heard from the Justice Department and EPA officials indicated the company could face criminal charges. “It’s a huge black eye for Volkswagen,” said Matt DeLorenzo, managing editor for news at Kelley Blue Book in Irvine, Calif. “They were counting heavily on diesels to meet fuel-economy [rules]. This brings that whole strategy into question." The EPA and the California Air Resources Board began investigating Volkswagen after an independent analysis by West Virginia University researchers raised questions about the vehicles’ emissions levels, the EPA said. “In September, after EPA and CARB demanded an explanation for the identified emission problems, Volkswagen admitted that the cars contained defeat devices,” the agency said. “The dogged detective work in the lab provided the data and resulted in an admission that VW did indeed have a defeat device in its software for diesel cars,” Richard Corey, executive officer of the California Air Resources Board, said on the conference call. VW, in a statement, said it is cooperating with the investigation but is unable to comment further on the EPA's findings and allegations. Janet McCabe, acting assistant administrator for the EPA’s Office of Air & Radiation, said that the agency will “hold VW responsible” for recalling the vehicles to reduce emissions, but said no recall order was issued as part of today’s announcement. The alleged violations are a blow to Volkswagen, which has heavily marketed its wide range of “Clean Diesel” cars to stand out from the competition. Consumer Reports, an influential shopping guide for many U.S. consumers, said late Friday it was suspending its “recommended” rating on two VW models -- the Jetta diesel and Passat diesel. "These recommendations will be suspended until Consumer Reports can re-test these vehicles with a recall repair performed," the magazine said. "Once the emissions systems are functioning properly, we will assess whether the repair has adversely affected performance or fuel economy." And in what could be the first of many suits, owners of Volkswagen and Audi models with diesel engines late Friday filed a class-action lawsuit against VW. The suit, filed in California, accuses Volkswagen of fraudulent concealment, false advertising and violating consumer rights laws. "Vehicle owners will suffer loss of vehicle value due to Volkswagen’s future recalls and degrading of performance characteristics such as horsepower and fuel efficiency in order to make vehicles meet EPA standards," the suit says. "The tinkering that Volkswagen will have to do by law to fix these vehicles will almost certainly degrade the performance to less than what Volkswagen claimed when it originally sold these cars,” said Steve Berman, a class action attorney in Seattle who brought the suit and has filed similar, successfully cases against Toyota and Hyundai. Vehicles with diesel engines account for a higher percentage of VW’s U.S. sales than any other brand. VW has also leaned on the performance of its diesel lineup as a key message to boost demand amid tepid U.S. sales, which are down 2.8 percent through August. The alleged violations also come just days before VW plans to reveal a significantly updated 2016 Passat midsize sedan to journalists at an event in New York City on Monday, in which Lenny Kravitz was booked to perform. The EPA probe is the latest in a series of government steps to crack down on automakers for violating U.S. emissions and fuel economy regulations. Last year Ford Motor Co. was forced to lower mileage estimates on hybrid models and compensate more than 200,000 customers. The company distributed payments ranging from $200 to $1,050. And in 2012, an investigation forced Hyundai Motor Co. and Kia Motors Corp. to restate and relabel the fuel economy ratings on some of their top-selling U.S. car and light-truck models. 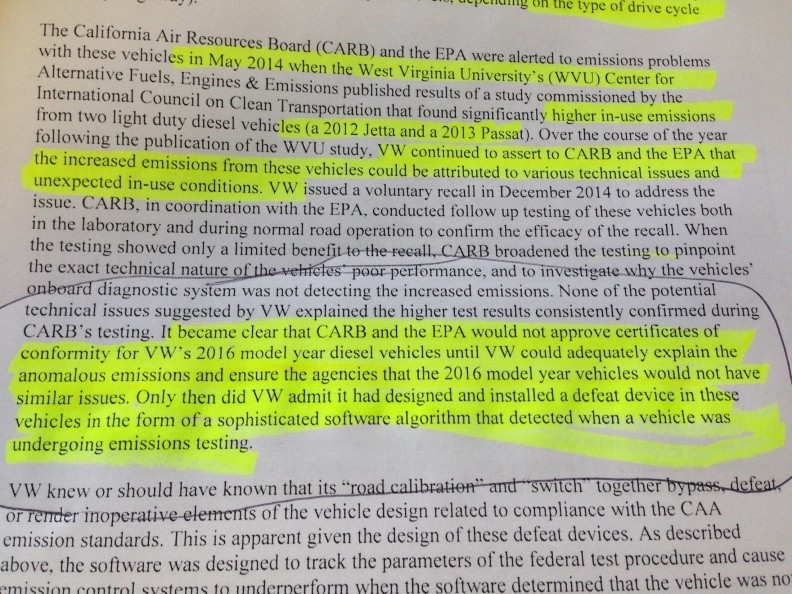 Part of the Notice of Violation that the EPA sent to VW on Friday. It describes VW's alleged violations of the Clean Air Act.